Take your friends out for a treat at Oviedo. This Florida city is popular for its great destinations for tourists and the best places to hang out for locals and visitors alike. Still there are natural sights to check out and things to do that you cannot find in other cities in the state. And when you are taking a large bunch of friends along it would be perfect to visit with a party bus Oviedo. Make a reservation now, call 407-374-2370. Only a party bus Oviedo FL will take you to different places in the city with all the works. From spacious luxury interiors, safe yet comfortable seats, audio and video equipment and all the latest amenities that you can find in a small apartment! It is also possible to find large party buses with their own private areas and toilets too! Isn’t this a great way to travel? 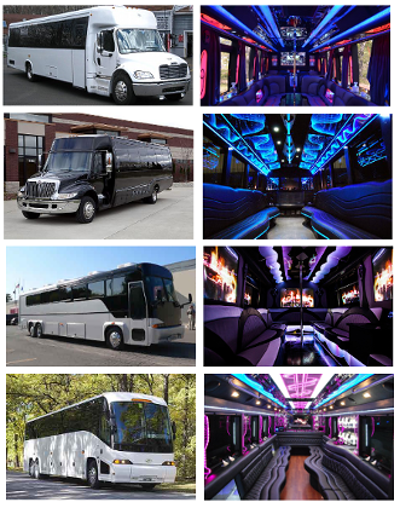 If a party bus isn’t your style, be sure to view our fleet of limousines in Oviedo, FL! And of course you will love that your party bus has its own professional driver. You do not have to sweat, stress and worry about driving your own van or SUV anymore! Have a merry vacation with all your pals as you take them safely to places that you want to go to in Oviedo. To book your preferred party bus vehicle, you need to call or email at least a week or two beforehand. This ensures that you have your party bus reserved minus all the hassles. It may also be very important to think of all the amenities and features that you want in your party bus ride. Booking takes a few minutes but you will be asked a few information about yourself as well as credit information to book your ride. You can also count on us to pick you up on time from your hotel or straight from the airport to take you anywhere. View all central Florida party buses and limos. For pricing questions, contact us at 407-374-2370. Take note of the following places to visit with your Oviedo party bus service. Lukas Nursery – check out plants from the most common to the rarest breed. This is also a great place to relax and commune with nature. Cup O Pottery – take your family or friends here and learn how to make simple pots, plates and cups. A truly great learning experience. Good Neighbors Farmers Market – you can buy the freshest produce and natural ingredients here. Meet amazing locals too! Twin Rivers Golf Club – a scenic golf club with the most amazing courses and the best holes. A must for any avid golfer. The Cigar Lounge Oviedo – this is a local bar where you can taste local brews and the best local dishes too. Your party bus Oviedo FL service could pick you up from the Orlando Executive Airport to take you to your hotel. You may also ask your party bus Oviedo FL service to come and take you to nearby cities such as Sanford, Kissimmee, Winter Haven, Lakeland, Clermont, Leesburg, St. Cloud, Lake Mary and Orlando. Close by services include party bus Sanford, and party bus Winter Springs.